Before NASA’s New Horizons spacecraft flew through the Pluto system in July 2015, many New Horizons scientists expected Charon to be a monotonous, crater-battered world. Instead, they found a landscape covered with giant mountains, vast canyons, a strange polar cap, surface-color variations and landslides. It would have taken serious imagination to see much of anything in the grainy telescope plates of Pluto that U.S. 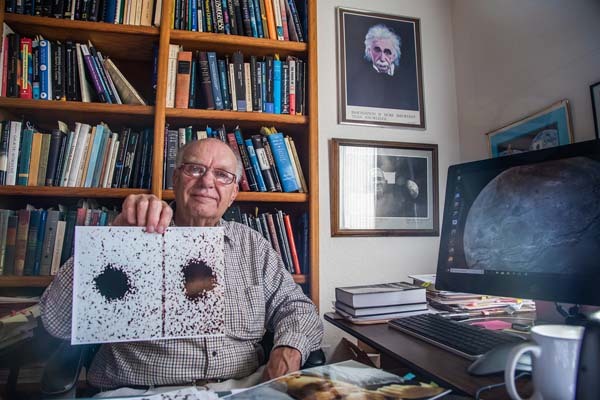 Naval Observatory astronomer James Christy was checking 40 years ago to refine Pluto’s orbit. But on June 22, 1978, Christy did notice something – a small bump on one side of Pluto. As he looked at other images he saw the bump again and again, only this time moving from one side of Pluto to another. Further examination showed the bump seemed to move around Pluto, cycling back and forth over Pluto’s own rotation period – 6.39 days. He figured either Pluto possessed a mountain thousands of miles high, or it had a satellite in a synchronous orbit. In the 48 years that had passed since Clyde Tombaugh discovered Pluto at Lowell Observatory in 1930, no evidence of any moon of Pluto had ever been spotted. 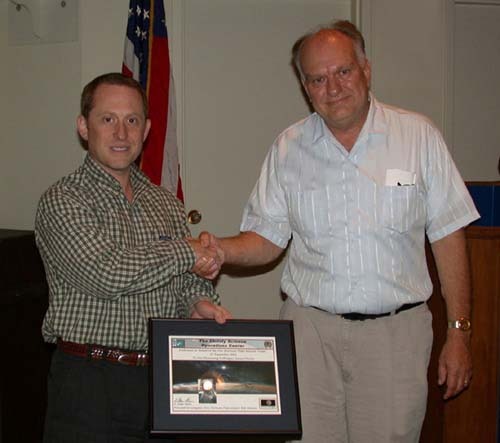 The Naval Observatory detailed the next steps to confirm the possible moon in a 1998 story about the 20th anniversary of the discovery: Christy scoured the observatory’s image archives and found more cases where Pluto appeared strangely elongated. He measured the angle (from north) where the elongations appeared, while his colleague Robert Harrington calculated what the answer “should be” if the elongation was caused by an orbiting satellite. Their calculations matched. But to be sure, they waited for the Naval Observatory’s 61-inch telescope to make one more confirmation. And on July 2, 1978, new images showed the elongation due to a satellite right where it was supposed to be. They announced their discovery to the world five days later. The discovery of Charon fueled Pluto’s evolution from a telescopic dot into an actual planetary system – and a source of many discoveries yet to come. In passing just about 18,000 miles (29,000 kilometers) from Charon on July 14, 2015, New Horizons completely transformed our view of the moon. High-resolution images of Charon’s Pluto-facing hemisphere revealed a belt of fractures and canyons that stretches more than 1,000 miles (1,600 kilometers) across the entire face of Charon and, likely, onto the moon’s far side. Four times as long as the Grand Canyon, and twice as deep in places, these faults and canyons indicate a titanic geological upheaval in Charon’s past. 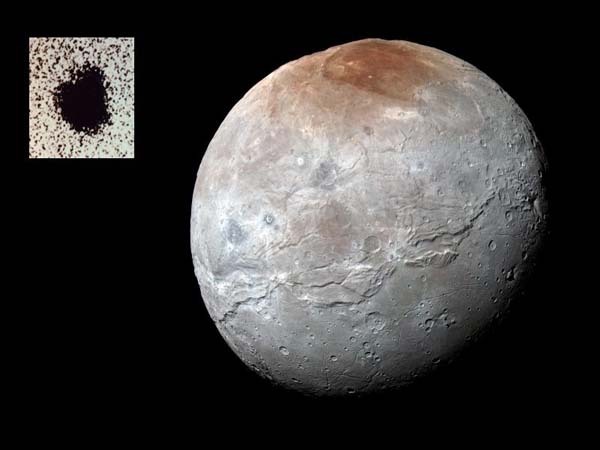 An especially cool feature is Charon’s reddish polar coloring. Methane gas escapes from Pluto’s atmosphere and becomes “trapped” by the moon’s gravity and freezes to the cold, icy surface at Charon’s pole. Chemical processing by ultraviolet light from the Sun then transforms the methane into heavier hydrocarbons and eventually into reddish organic materials called tholins. “Who would have thought that Pluto is a graffiti artist, spray-painting its companion with a reddish stain that covers an area the size of New Mexico?” asked Grundy, lead author of a 2016 paper on the phenomenon in the journal Nature. While wondering whether the name Charon would be approved, Christy checked the dictionary and found “Charon” was actually a real term — the mythological ferryman who carried souls across the river Acheron, one of the five mythical rivers that surrounded Pluto’s underworld. With that, he knew the name would be a perfect fit for a companion of Pluto and made that linkage known to the IAU, which approved the name Charon. From fraction of a blob to world in only 30 odd years at 40+ AU. That’s not too bad.